Have you guys seen the movie Transformers? Cool isn't? It even get's cooler when you continue reading. 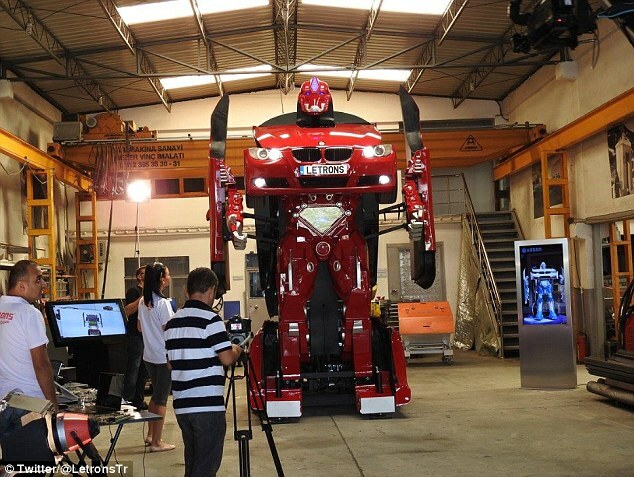 A group of Turkish engineers adapted an ordinary BMW into a Transformer that turns into a giant robot with arms and legs at the touch of a button. In a process lasting seconds, the car doors open and extend into two blade-like arms. Finally, a head emerges from the car roof, creating a fiercesome-looking machine that towers over the tarmac. It took a team of 12 engineers and four supporting technicians from Turkish firm Letvision built the fully-working prototype, called ANTIMON. Although the model does not have a price, the company plan to sell the Transformers in the future. The fifth installment of the Transformers film is due to hit the big screen in 2017. Earlier this month, cars were seen whizzing through the streets of London for the filming of Transformers: The Last Knight. So tell me, will you be riding on this?